In a reverse kind of manifest destiny, a Hollywood actress and her producer husband sought to produce a dream home on Florida’s Gulf Coast. Sited on a double plot of land that stretches purposefully into Sarasota Bay and the Intracoastal Waterway, the three-story Point Crisp residence interacts with nature and light. These were courted largely by virtue of a lush garden walk to the front entrance, an outdoor cooking/dining space, a glass-encircled “point room” for entertaining, a circular floating staircase ascending to a glass floor that channels sunlight into the space below, pneumatic glass tube elevator and large covered patio with a folding wall of glass. The undulating shape of the roof was inspired by the water. 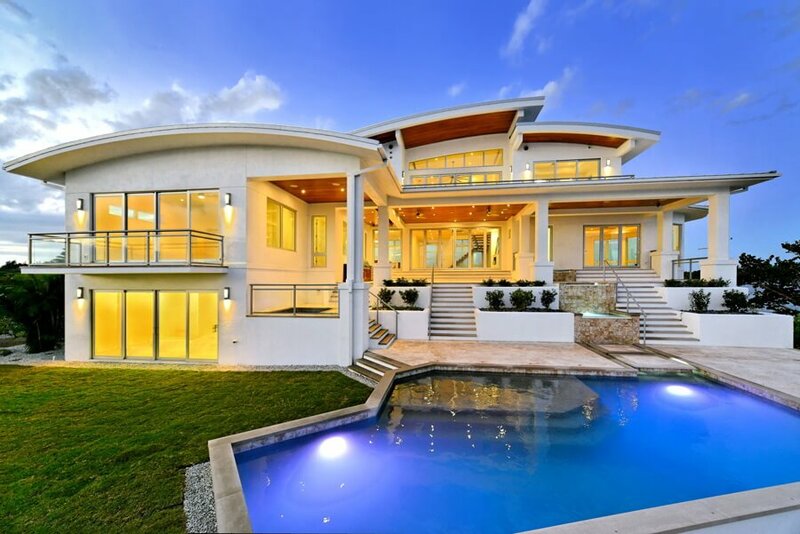 The four-bedroom, five-bath home boasting 300-degree water views from most points including its ample closets, as well as the master bath shower with a large window of electrified “smart glass” that can be switched on for privacy or off to reveal a long view across Sarasota Bay. Amplifying storage and improving the use of exposed space, kitchen cabinets are 16 inches instead of the standard 12 inches deep and bathroom vanities lift with interior lighting and concealed outlets. Designed by Mark Sultana of DSDG Architects, the home achieved LEED Gold status.